Did you know that the 9th -17th June is Bike Week? Nope, neither did I! For us, bike week’s tend to be when we are away in Ruby the VW Campervan, (previously Bluebell the Motorhome). In fact one of the very first gadgets we brought for Ruby when we bought her last year was a towbar and an Atera Strada DL3 Bike Rack, a phenomenal piece of kit, which usually attracts a lot of attention onsite as Keith effortlessly tilts the rack (with bikes on) back several times a day to enable us to get into the tailgate boot. For us when we go camping, we like to pitch up and not have to move the van for the duration. We use the bikes to get us to and from the local town or city for supplies and a look around. 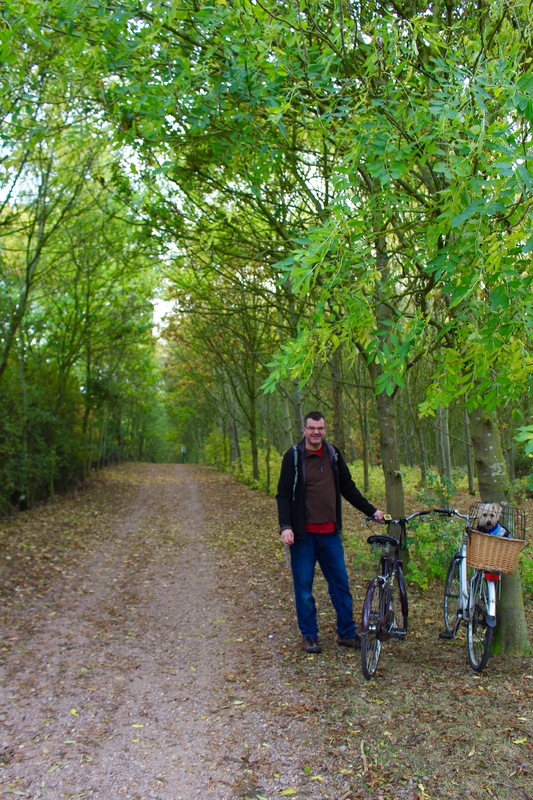 We also LOVE cycling on converted disused railway lines, now made into bridleways, or canal towpaths – traffic free routes are so relaxing and enjoyable, that now we actually base our holidays on where there are traffic free cycle routes to enjoy. 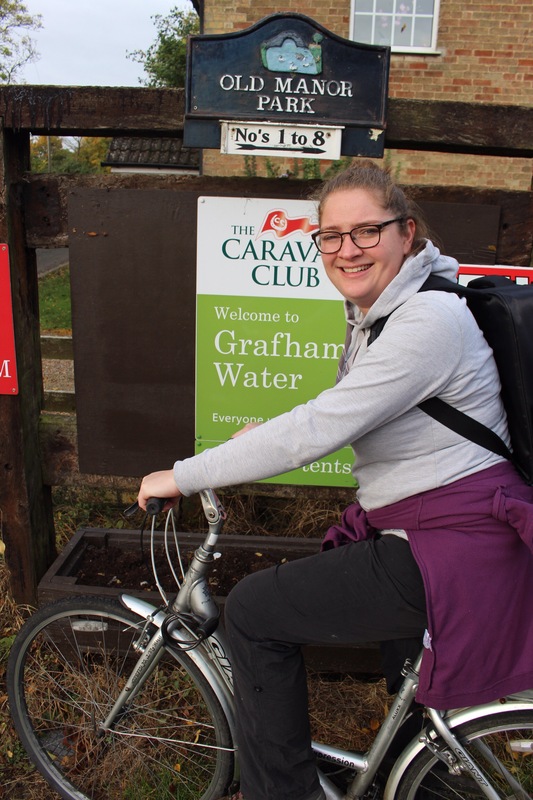 To celebrate Bike Week, and to accompany my recent “Top 10 Campsites for Walkers” blog post, I thought I’d share with you our favourite campsites that have direct or very close access to Cycle Routes in the UK. We actually only recently discovered this gem of a club site, however the Pontcysyllte Aqueduct has been on our list of places to visit for a long time now. The site is conveniently located to access the canal and is about 3 miles cycle to the UK’s longest and highest aqueduct. You can carry on to Llangollen for an extra 4 miles. The canal path itself is breathtaking. It’s a popular route but one worth doing. In the opposite direction from the site you can cycle (or push your bike rather!) though the impressive Chirk Tunnel. 2. Devizes Camping and Caravan Club Site for the Kennet and Avon Canal Path and Caen Hill flight of locks and Devizes in one direction and Bradford on Avon in the other. This campsite is open all year round, in fact we visited in winter and enjoyed a crisp winters day cycle. The route to Caen Hill Locks is only about 3 miles, and pretty good surface. The locks are fascinating to see and there is a lovely tea room at the top. 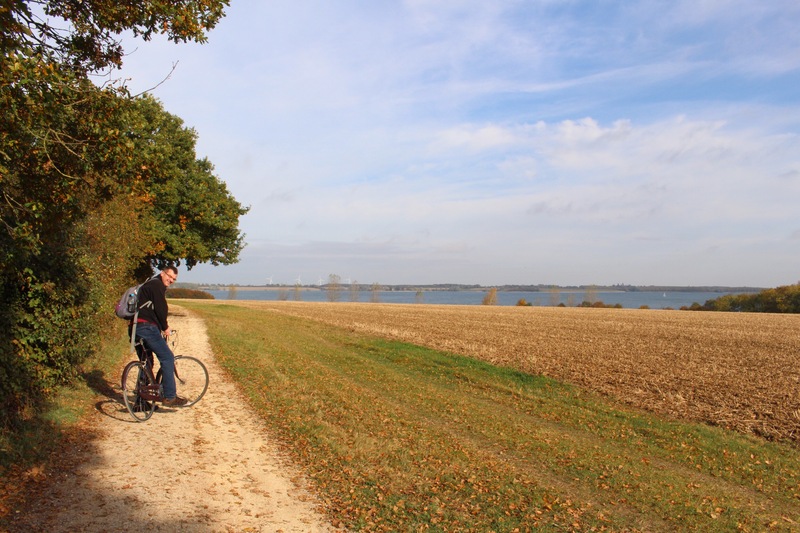 We’ve developed quite a liking for cycling old railway paths – largely because they tend to be flat, or have a very gentle incline, which makes for happy cycling. There are quite a few to choose from in The Peak District, but we think we like The Monsal Trail the best as it links two interesting and pretty market towns, Buxton and Bakewell (which of course is home to the famous Bakewell Pie. The Monsal Trail also has some beautiful scenery and some impressive tunnels which you can cycle through. This is one of our local ones and if you time your ride well you will be lucky enough to experience a steam engine or five choo choo past you, as this line still runs providing leisure rides mainly at the weekends. Our favourite bit is the approach to the very pretty waterside town of Wroxham where you can pick up some delicious fish and chips and enjoy them overlooking the broads. Breck Farm is a fabulous little campsite with a lovely sunset, and although we haven’t stayed at Attlebridge Station CL its on our list for this year as it looks superb. The converted station has been done amazingly well. 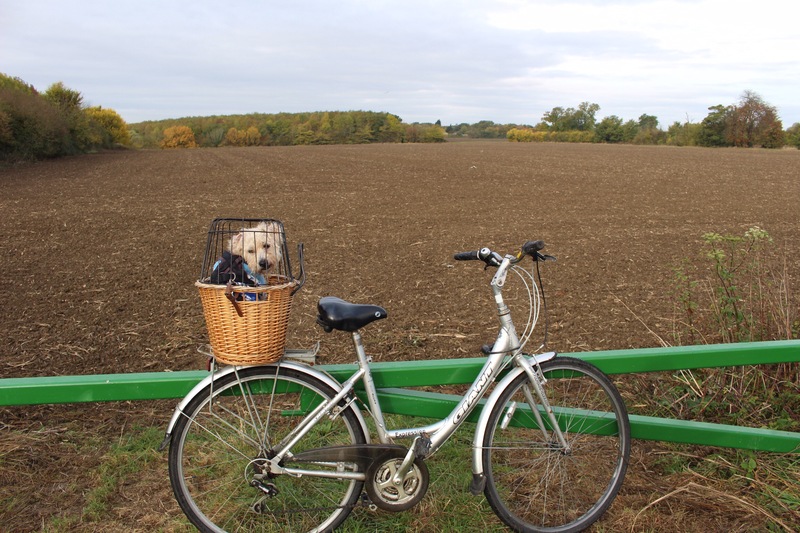 The Marriotts Way links Norwich with Ayslham, so it’s possible to cycle for a day trip to Norwich from here. There is a fabulous railway museum and cafe just down the road too. The position of both sites is right in the middle of the Marriots Way so it’s perfect to break into two 13 mile each way days. First of all, a huge well done to Canterbury Council for having the business sense to allow motorhomes to park overnight in their park and ride facility for a small charge! 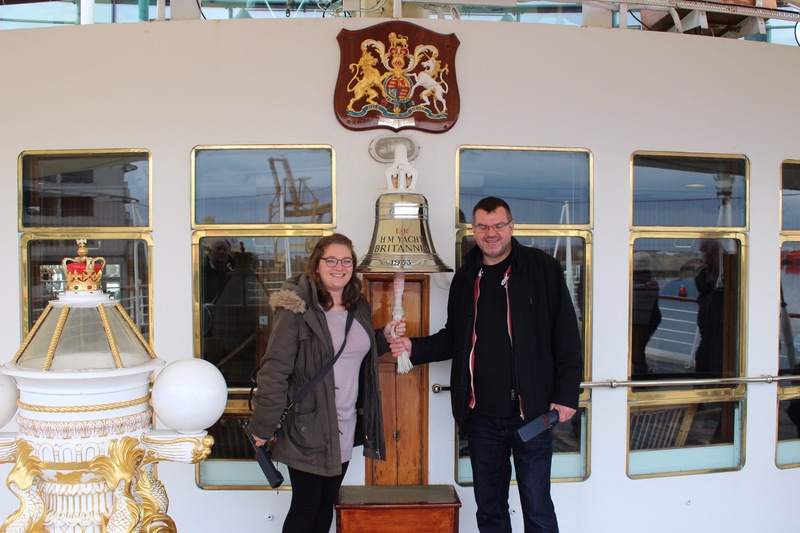 We really enjoyed our couple of days in Canterbury, a highlight of which was our bike ride on the Crab and Winkle Way – an off road paved track all the way to the seaside town of Whistable. If you’re an oyster lover – this is a heavenly place to have your lunch! 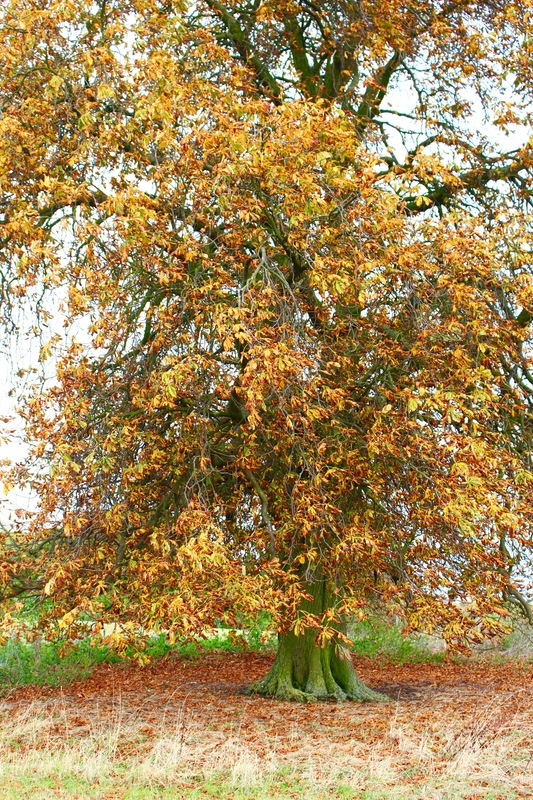 Rutland Water is a large man made resevoir in the East Midlands. 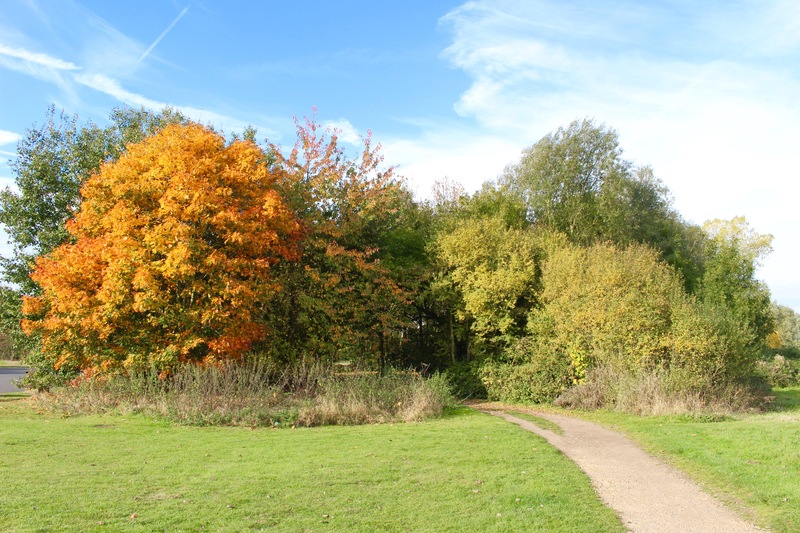 It’s used for watersports, cycling, walking and is a hive of activity year round. You can either hire bikes there or take your own, and the paths are a mixture of Tarmac and loose sand/stone so hybrid or mountain bikes are best. 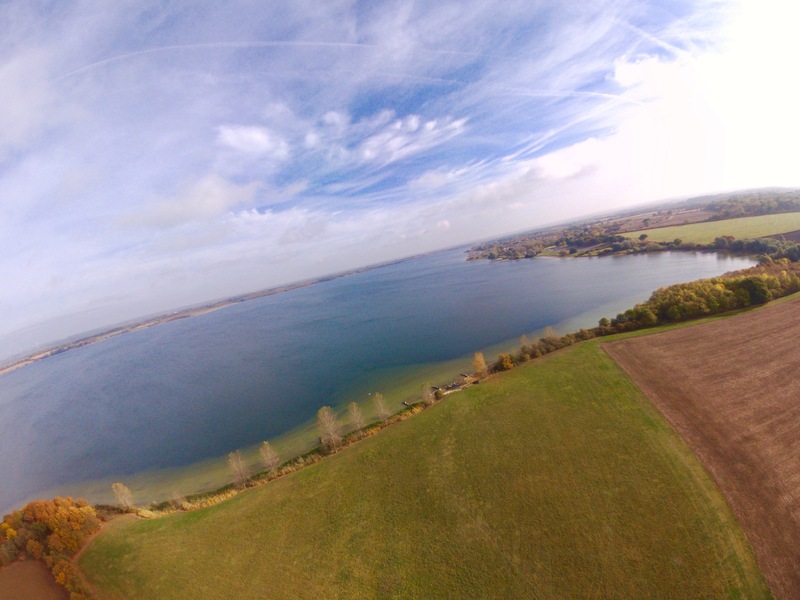 Along with Alton Water (below) this is another Anglian Water reservoir/water park. There are 10 miles of offroad track and the campsite is lovely too. If you re into Geocaching there are also loads and loads to find on this trail. 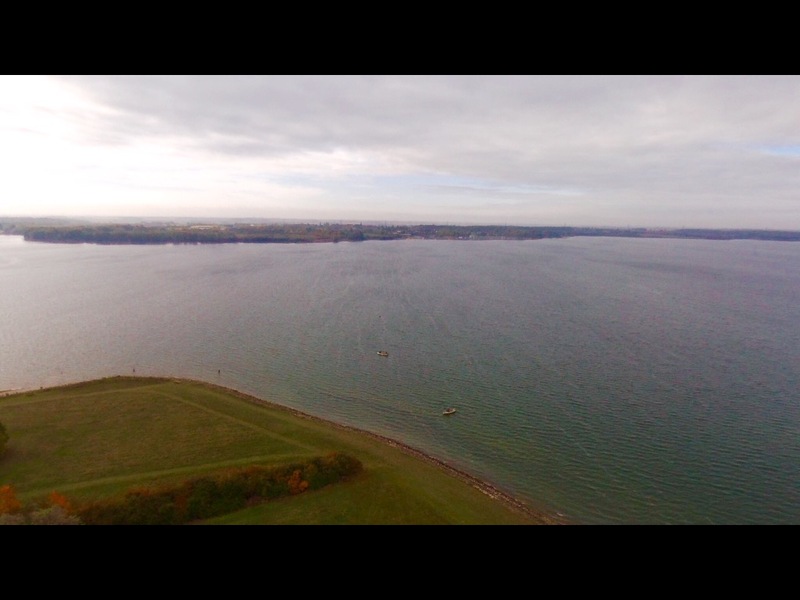 Grafham water is also used for trout fishing and we had some wonderful local trout that we brought from a house down the road from the campsite. The Briar is a lovely little C&CC club site just 3 miles on a very quiet road from Alton Water. There is also a lovely pick your own fruit farm in the same village and the owner makes some wonderful marmalade which he sells. Alton Water was an enjoyable cycle and you pass a wonderful wild flower field on the way round. Just lovely. 10. Glen Nevis Campsite, Fort William for Neptune’s Staircase and The Great Glen Way on the Caledonian Canal Up to 72 miles linear, but we did about 8 miles each way. It’s taken us about 5 trips to Scotland before we actually used our bikes! When we think of Scotland, we think of huge mountain ranges and none bike friendly (well for us anyway!) hills. It took at least 5 trips through Fort William before we stopped at Neptunes Staircase and realised that actually there was a really beautiful canal towpath we could follow (which was obviously.. flat!) The campsite is nestled right under Ben Nevis by the way – so you could attempt to climb it whilst staying there. As you can see, where we take our doggie with us on all these trips and he sure doesn’t half get some attention on the way. Many people stop us and ask where we got our dog basket from. It’s from Amazon (link below) and as you can see, he loves it! We are always on the look out for new sites/cycle combinations, so where is your favourite? Let us know – our list is always growing! Ruby the VW Campervan is nestled amongst 4 other motorhomes beside the Oxford Canal in Warwickshire. We are at Britstop number 427/18 and for the first time ever, we are sharing our Britstop location with other vans! In 6 years of using Britstops, we’ve never encountered other vans! This weekend’s mini escape has been a little topsy turvy to say the least. We were supposed to be going to see Tears for Fears tomorrow in Birmingham, which meant bank holiday camping plans were difficult. Then, Keith popped onto Arena Birmingham’s website 2 days ago to get parking directions when he noticed TfF wern’t listed this weekend. A little bit of digging and we discovered that the gig had been been cancelled. Thanks for letting us know.. not. Thank goodness I have a nosey OCD husband otherwise we definitely would have been non the wiser and would have turned up. As soon as we found out the gig was off, before we even investigated rescheduling/refunds, the next step was to embrace the fabulous weather forecast, and our now completely empty diary and get ourselves onto a site somewhere for the weekend. All the forums/facebook pages I follow had been saying May bank Holiday had been fully booked all over the country for ages so my hopes were not high and I went to work extraordinarily hacked off to say the least. Happily my husband is some sort of miracle worker and found us a site within an hour – vaguely in an area that we wanted to visit at some point this year, Chirk. 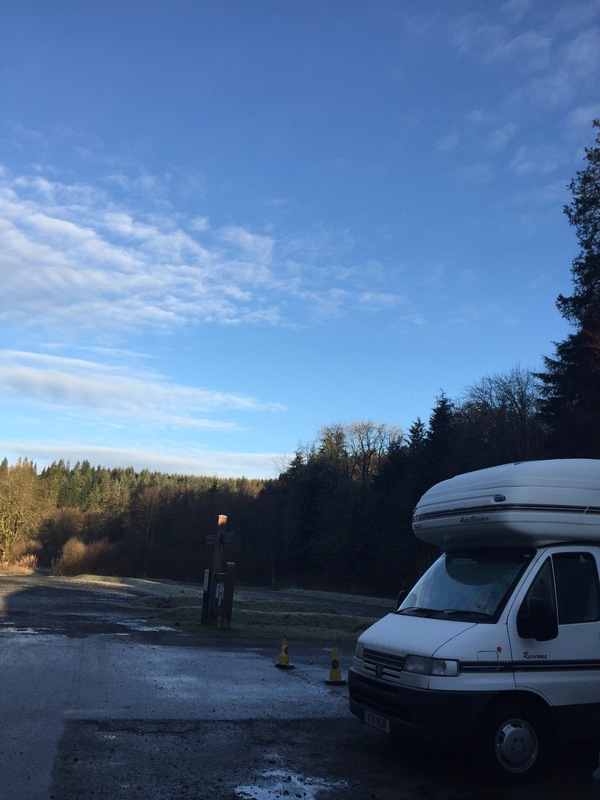 Our preference was of course the Camping and Motorhome Club’s “Lady Margaret Park” in Chirk – it ticked all our boxes, we’d had several people recommend it and it had near enough direct access to the Llangollen Canal and it’s cycle route to Pontcysyllte aqueduct. Obviously it was fully booked already, but the warden told us to keep trying. During work on Thursday my email pinged with the email “Booking Confirmation – Lady Margaret Park” – Keefy had managed to get us on THE site we’d wanted. Woo! I had work until 4pm Friday so we decided to break the 4 hour trip to North Wales with a popular Britstop half way. We phoned ahead, booked a table for dinner and off we tootled, sunglasses on feeling pretty chipper. Britstop 427 offered a very warm welcome, the landlord liked the look of Ruby – and we enjoyed showing her off like proud parents, especially as we gave her a little makeover this week. We had a beer on the canal side before heading inside for a delicious meal and crashing out early. It’s been a hell of a week! It delayed our departure a touch, but was fascinating to watch Warwickshire Fire Servie carry out a drill. Ruby gained a few more admirers from the fire crew and we were treated to a serenade of Morning has Broken. One of the more surreal mornings we’ve had, thats for sure! Our journey to Chirk was smooth – a highlight was spotting Ruby the VW’s twin! After a quick stop at the local butcher’s in Chirk of course we rolled onto the club site at midday exactly. It took us a while to set up as it’s been some time since we’ve been out on site with all the dry weather gadgets but it was soon time to have lunch – steak and stilton wraps, before having a little wander into town. 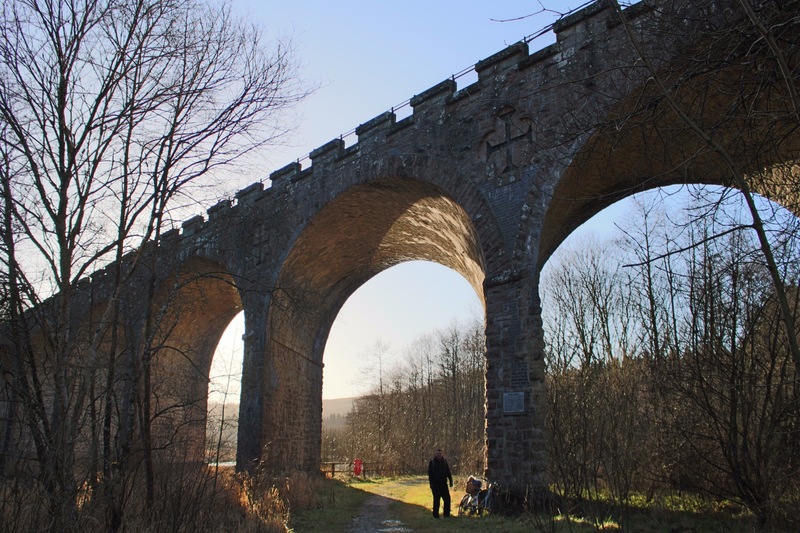 We enjoyed our walk, which took in the Chirk aqueduct and viaduct – which are positioned so close to each other that from a distance it looks like they are double decker. We wandered across the aqueduct back into England and found my dream house. We then picked up a couple of bits that’d we’d forgotten from shop before walking through Chirk tunnel – an amazing piece of engineering – a canal tunnel that is almost 500m long – so long that you can barely see the end of it! It’s very cool – boats can only go through single file and have to have their light on so people know they are coming. We watched boat go through alongside us, and then some canooists we waiting to go through next. I quite fancy a go at that myself. Back at the site – it was glorious weather so we tried out these self inflating sofabeds that we got off Dad and Jen for Xmas. I say self inflating – what I actually mean is “self inflating if you run around in circles wafting your arms around looking like a complete tool!” Our next door neighbour actually took pity on me and came to ask if I wanted to borrow his air pump – then looked mighty confused when I say thanks but this is actually how you’re supposed to do it! Once inflated though my goodness, they are comfy – it’s like you’re floating on a hammock! We had a delicious bbq for tea which featured some welsh dragon sausages and welsh lamb leg steaks from the butchers down the road, before we both crashed out again at 9pm! 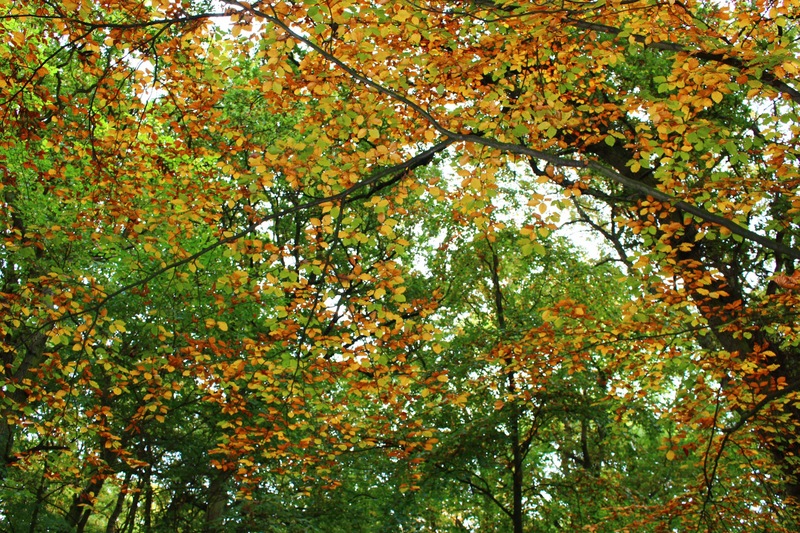 Another day of sunshine was forecasted for today – we could hardly believe our luck! After a tea in bed watching the rabbits behind us, we got on with breakfast – a full English on our outside gas ring. I love cooking al fresco- and is there anything greater than walking through a campsite on a sunday morning with all those AMAZING smells tickling your nostrils. No, I don’t think so either! Whilst I got on with breakfast, Keith prepared the bikes and by 10.30 we were off on our way. We joined the canal tow path just by Chirk Station – and the first bit towards Pontcysyllte aqueduct is especially beautiful – steep banks either side, lush green trees and banks upon banks of bluebells and wild garlic. Just wonderful. In actual fact – the whole cycle all the way to Llangollen (9 miles each way linear) was just breathtaking. 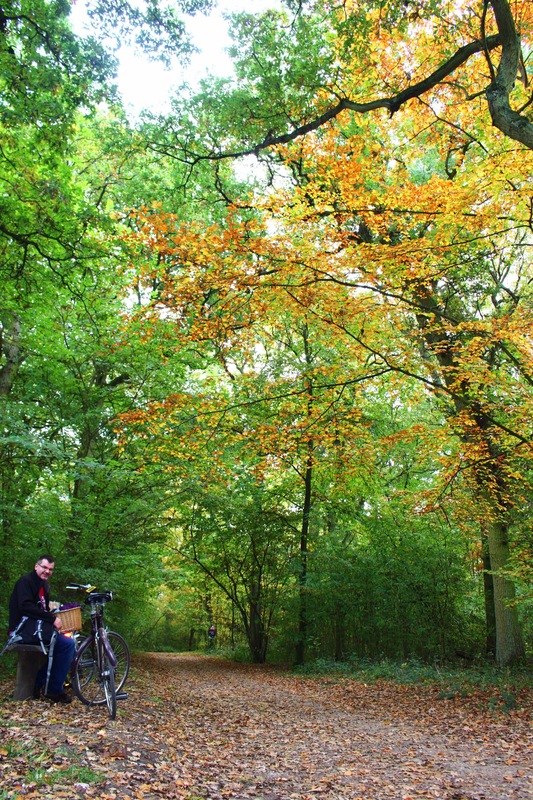 It has absolutely worked its way to our (imaginary for now) list of top cycle routes in the UK. The main feature of course is the Pontcysyllte Aqueduct, the UK’s longest and highest aqueduct, which has now received World Heritage Site status. As such it is absolutely heaving with people, on the tow path on bikes and foot, and on the canal in canalboats and canoes; but who can blame them. We just loved it there. We walked our bikes across the aqueduct, then carried on the canal towards Llangollen (you have to go over the bridge, cross the road and then take the new tow path). This stretch was another breathtaking sections, and the 4.5 miles to Llangollen just flew by. At Llangollen you have the option to take a boat trip on a horse drawn barge. We didn’t fancy the trip but enjoyed watching the horse pull the barge – we’ve never seen this before. We turned back round at this stage but you can carry on to Horseshoe Falls. After stopping for an ice-cream at the sweetie barge and a quick purchase of some souvenirs (some of you reading this will know we are suckers for souvenirs 😜) we soon found ourselves back at Ruby – exhausted but completely overwhelmed by the scenery. After a chill on the inflatables (and causing amusement to yet more campers on the Caravan and Motorhome Club Site!) we cooked fajitas for dinner and had a little evening stroll down across the border back into England, to the Bridge Inn for a swift one whilst watching the sunset, before bed. What a cracking day. You can view our Llangollen Canal cycle video highlights here. Monday dawned way too quickly – we were having far too much of a good time to have to pack up and start spinning Ruby’s wheels back home! Luckily we were both feeling it, so after packing up, we drove the mile down the road to Chirk Castle National Trust in a hope to procrastinate! 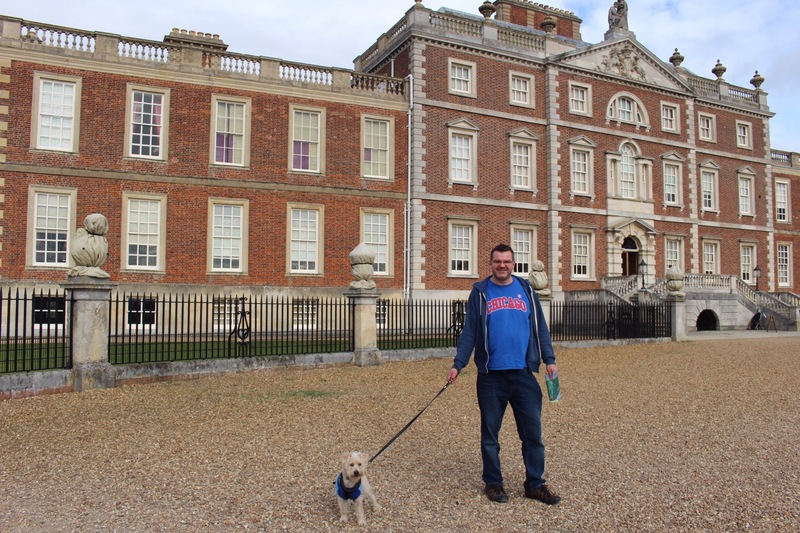 We had to do the same for the formal gardens and woodland unfortunately as dogs weren’t allowed in there either – only the estate grounds for the furry ones. I assume this is because of the actions of selfish dog owners in the past leaving their poop. The gardens were lovely, but I don’t think either of us enjoyed visiting them without each other. Especially seeing all the families and couples enjoying picnics etc. 😦 But if you don’t have a dog – I’m sure you would just love it there! All too soon, it was time to hit the road – we couldn’t put off the impending bank holiday journey home any longer. Luck was once again on our sides though it seemed as we got home in 4 hours exactly with no traffic jams. Unlike the poor folk who were queuing to get out Norfolk on the A11 – we hit no traffic problems whatsoever. If you haven’t yet visited this area and enjoy off road easy cycling, this is a must for you. It was another wet and wild night last night- we even had some thunder and lightening! Again we had winds ofup to 40mph- needless to say Jazz was on our bed again! Ruby is coping so well with the wild weather – we are toasty inside despite having no heating. The bikes are ok on the back still and it’s doesn’t feel as wobbly as when we were in Bluebell the motorhome – I suppose we are lower. Despite the weather overnight today dawned a beautiful morning. We went to the farmhouse for some fresh eggs – and they couldn’t have been fresher, the farmer had just picked them out of the nest- they were still warm. They made the wonderful egg and bacon rolls – I’ve never seen such a large yolk. We walked down to the bus stop at the end of the field and caught the number 349 to Tenby. It was a 20 minute journey and cost £5.50 pp return. Not bad value at all- especially when you can use your ticket for unlimited travel throughout the day. We walked through the town down to the Harbour and stopped at The National Trust 15th Century Tudor Merchants House. Worth a visit if you’re a member but if not again we thought the £5.75 entry charge a little steep as there wasn’t much to see at all. Tenby Harbour is absolutely STUNNING. There are loads of cute pastel coloured houses that line the street and the Harbour is full of boats. The beach beyond the Harbour has lovely sand and the bag is full of banana boat rides and pleasure trips. There are tiny little lanes leading away from the Harbour- it was just gorgeous. It knocks socks off places like Southwold. We saw a sign for lifeboat rides and decided this sounded fun – even better than dogs were allowed obviously! So we booked on for 1:45- a bargain at £5 for 20 mins we thought. We spent the time before the ride mooching and shopping- all the shops were dog friendly – there was such a lovely atmosphere here. 1:30 arrived and so we made our way down to the Harbour to board our Lifeboat. The ride was so much fun and it was really interest riding on an actual lifeboat (now out of service). All that see air and we worked up quite a thirst! So we found a pub with a sign claiming to have the “most sunniest beer garden in Tenby” – I found a seat whilst Keefy got the beers in- a Tenby beer for him aptly named after a Tenby lifeboat and brewed in the brewery on site, and a Welsh dragon cider for me. We then went for a delicious fish and chip lunch before another pint at the Lifeboat, which had a really cool bar made out of an old Lifeboat (see pic above), although it didn’t serve any local beers. Before we caught the bus home we stopped at the fishmongers for some locally caught cod and samphire before looking around once more soaking in the atmosphere – it’s a fabulous place to visit and a real highlight of our trip so far. Also EVERY where was dog friendly even the shops! The rest of Thursday night we just chilled and enjoyed a cheese board for supper whilst watching Cracker. Friday arrived and it was time to pick up the van and move onwards. 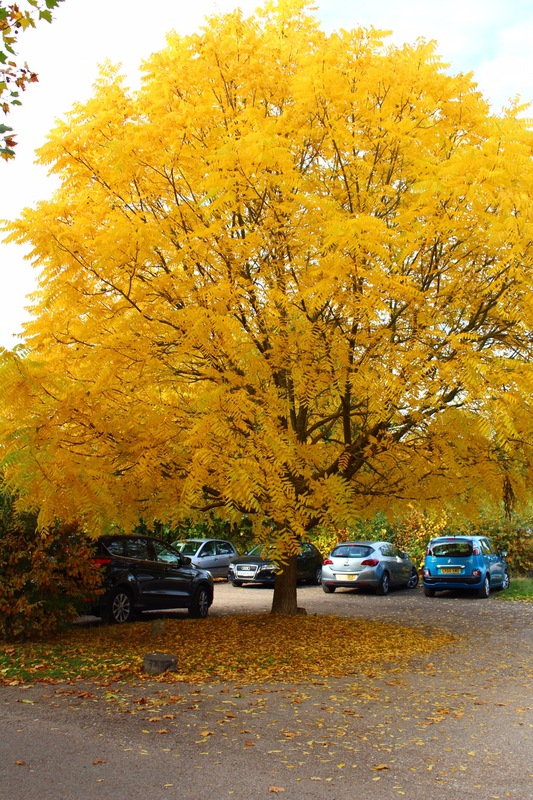 We had enjoyed our stay at Middle Hill Farm and would recommend it to anyone visiting this area- especially to those who don’t want to drive to explore as the bus route was really good from very close to the site. After leaving the site we made a stop at Pembroke to see the castle. Pembroke Castle was birthplace to Henry VII and although we didn’t go in we enjoyed a terrific walk around the outskirts which gave great views of the impressive outside . We drove on to nearby Nayland and followed signs for the Marina. The reason for our visit was Brunel, who lived here for a time and extended his GWR to have a terminus here- aiming to build an ocean terminal for onward travel to New York. Nowadays you can cycle some of this GWR line as part of the Brunel Line which we did and was fab. We did only 5 miles each way but the full line is 9 each way. On the way to Johnson it felt hard- on the way back we realised why- we barely peddled! Brunel was such a genious, building these tracks at an exact angle to not feel steep so the steam trains could manage the incline. After our cycle we heading onwards to our next stop for 3 nights, the St Davids Camping and Caravanning Club Site. On arrival it hammered down so we had a quick set up before an early dinner of Pembrokeshire Chowder with the fish we got from Tenby yesterday. Oh wow- don’t like to blow my own trumpet but it was delicious. Recipe here! 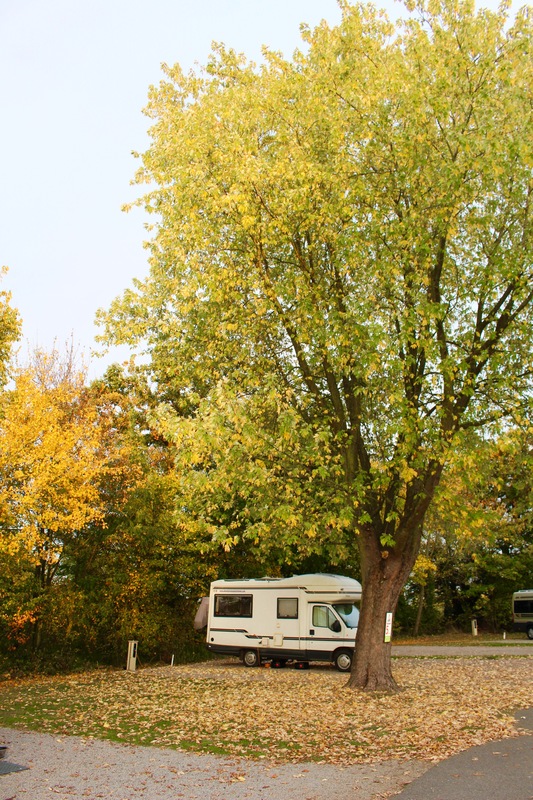 Ruby the Campervan is parked on Court Farm Campsite, Twigworth, Gloucester- a lovely landscaped C&CC Certified site with shower, hook up and loo- best of all it’s only £15 pn. We set off from Newark around 10:00 and had a smooth journey to Court Farm, apart from the weather which was just grim. Happily though as we rolled onto the campsite at 12:30 the rain dried up, leaving us to set up in the dry and even contemplate lunch OUTSIDE! Happy faces all round! Lunch was leftovers from a curry we’d had on Monday and whilst I prepared it, Keefy dismounted the bikes off the rack. By 2pm we were on our bikes towards Gloucester. We picked this site due to its close proximity to the historical city of Gloucester- it’s a very easy 20 minute cycle into the city centre, you basically turn right onto the main road (with pavement the whole way) and keep going straight. If you don’t fancy cycling there’s also bus stop right outside the gates. First stop in Gloucester was the cathedral- which was gorgeous. We took it in turns to go inside for a look as we have Jazz with us- inside is just breathtaking. The main feature were the corridors with the most spectacular cloisters we’ve ever seen. They are also the oldest surfing cloisters – so no wonder the cathedral is used regularly for film and TV locations. You may even recognise these corridors as they were used as Hogwarts in Harry Potter. Another highlight inside was being able to see Edward II’s tomb. Before leaving I’d noticed on the Gloucester city website that is an online self led historical walking tour so I led Keefy on it from the Cathedral. It took in lots of interesting historical sites and buildings, including a couple of watering holes too. Perfect for an afternoons exploring. The absolute standout was the hidden gem that there is no way we would have seen without this tour; the 16th C medieval timbered 4 storey townhouse which was complete with tiny alley way. It’s surrounded by McDonalds and KFC! And from the main the high street the only sign of it is the tiny top window sticking out. I think we may have been lucky that the gate was open to the alley so we were able to nip down, where you could see the actual side of the building complete with 16c timber. It was amazing – but sadly photos just won’t do it justice. 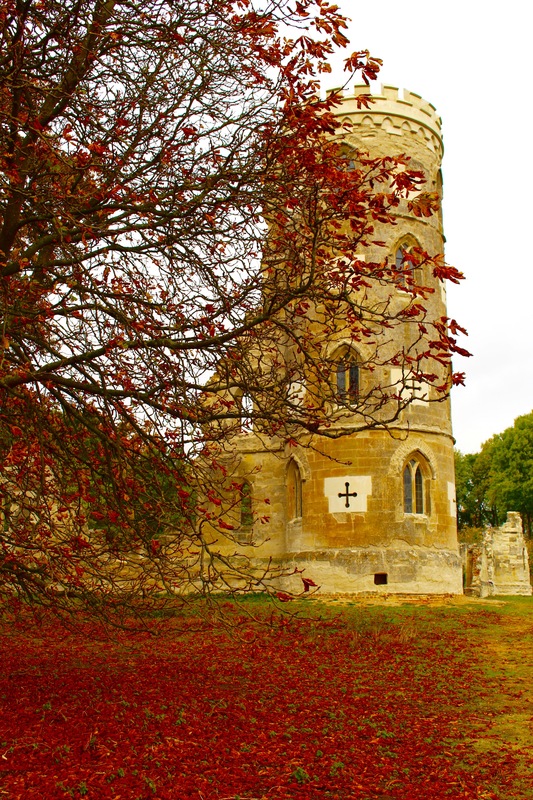 Anyone visiting Gloucester – I would highly recommend following this tour! It’s available here: and throughout the city there is free wifi so you can use that to follow the tour. There is also a fun piggie trail on at the moment so we enjoyed spotting the pigs as we made our way around the city. My favourite was Harry Potter Pig! We stopped for a drink at the historical Fountains Inn which had a pretty courtyard and is on the the oldest site of brewing in Gloucester. We also popped into have a look at The New Inn, which had a fantastic galleried courtyard – one of the best, if not THE best in the country. Sadly the pub has been taken over by a chain and had sky sports blasting out so we decided not to have a drink here. Just before retrieving our bikes, we popped to look at the Quayside which was lovely. at Cotham Park RFC, which had allowed campers to book a pitch on their field. We booked in May- you need to book early as it’s a very popular event and location, the campsite is only 20 mins off road walk to the site of the Fiesta. It is up hill on the way back though! We decided as there wasn’t much entertainment on during the day on Thursday, that we would go back up to Ruby, make a picnic and head back down for the 6pm Mass Accent of special shapes. Picnic made, off we walked, this time with picnic and chairs. Unfortunately however the mass assent was cancelled due to the wind. We sat for 3 hours waiting for the night glow, and felt pretty unimpressed the updates and also the lack of entertainment. This, along with a ridiculous queue for the loos, which ended in someone saying “join that queue over there, people are peeing in the bushes it’s much quicker(?! )” meant that our moods were quite low by the time the night glow began at 9pm! Happily though, the nightglow was fantastic, it was where lots of balloons were tethered and lit up in a choreographied programme to music. Something I’ve never seen before, it really was great. The fireworks that followed were equally good, so we hiked up the hill with thousands others afterwards feeling happy. Friday dawned quite a bit earlier than I am used to on holiday, my alarm sounded at 5am. Yes, you read that right! The reason was the mass assent scheduled to take place at 6am. Keith decided he was too tired and couldn’t bear the thought of the walk down in case the balloons didn’t go up- completely understood, and was almost tempted to not go myself, however I knew I’d be so grumpy if I missed it. So I left Keefy and Jazz in bed, and joined twenty or so others from our site in the walk down. You can imagine my relief when we got the green smoke, signalling weather conditions were good to fly. 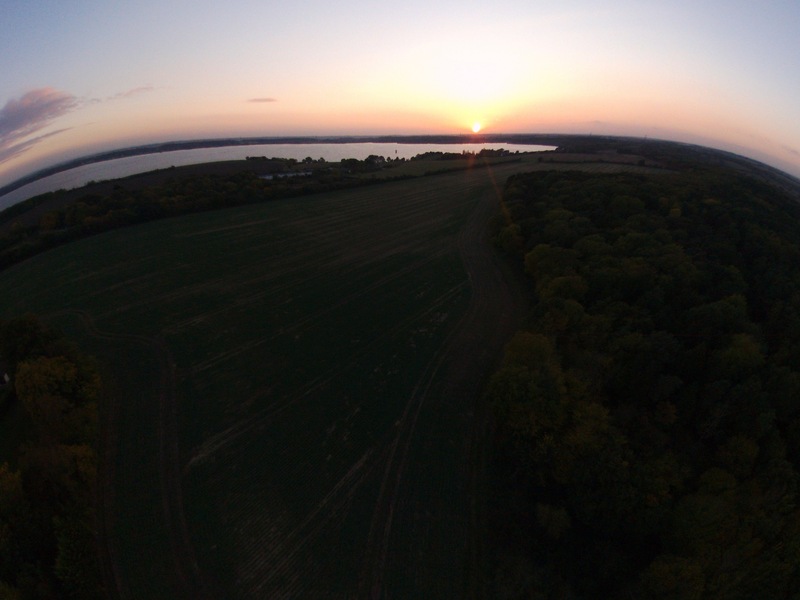 My relief turned into absolute joy and wonder as the first of the 104 balloons floated up, up and away. I’ve never seen such a beautiful graceful site- certainly not at that hour anyway lol! After an hour or so nap we got up- I was still happy about seeing all my balloons and Keith decided that he wanted to go down in the morning. We had a lazy morning before unloading the bikes and making the short 2 mile ride to Clifton Suspension Bridge. Brunel’s design won awards and is now grade 1 listed. It’s not hard to see why. It’s beautiful! There are several viewpoints and a newish visitor centre which we visited (free). We also cycled over for free – but to drive over costs £1. I hadn’t prepared myself for such a steep gauge that the bridge is built over- it’s actually really steep! We cycled back to Ruby for a late lunch/early dinner of chicken fajitas which were absolutely delicious, what a feast! then settled into Ruby for a duvet afternoon as the weather deteriorated and we dead all the balloon fiesta activities were cancelled. compared to yesterday’s weather conditions to try and reassure Keith his early rise wasn’t wasted! When we got the green smoke – to say the balloons would fly, it was a tremendous relief! They have a system similar to the Pope announcement smoke system to inform the public and the pilots whether they could fly. Talk about tension! After almost 30 balloons took off, we heard an air raid siren- this was to inform pilots that having received feedback from pilots already in the air, the conditions were not great therefore no more could take off. It wasn’t a huge surprise- visibility wasn’t great the balloons were disappearing into clouds! Nevertheless we went back to Ruby happy- Keith had seen enough to feel like a mass assent. leaving the fiesta and moving to a new site. We were driving up to the SS Great Britain first though, so were happy to have an early start. We arrived at the car park of SS Great Britain just after 9am- a first for us on holiday that’s for sure! We were surprised to read that overnight camping is allowed here- one for future reference that’s for sure. It didn’t open til 10 so we treated ourselves to a pot of tea and toasted tea cake at the cafe next door before joining the queue for the ship. Brunel s SS Great Britain was the first public ocean liner – and remarkably made the trip to New York in just 2 weeks. The visitor centre is excellent- you get to go beneath the water and see the base of the ship, and propellor in dry dock. The dock where it is now is where the ship was built, and we really enjoyed our tour on the ship, beneath the ship and around the museum. Following our tour we drove the short distance to our next campsite, The Knights Folly camping and caravan club CS- where we received the warmest welcome we’ve ever had onsite! The owners were lovely and absolutely adored Ruby! The site was nicely laid out and had the cleanest loos and showers we’ve seen. It was a bargain at only £18pn. dinner we had chicken stuffed with goats cheese, cooked in the slow cooker for 2 hours. It was amazing- definitely cooking that again. We crashed out at 9pm, despite our afternoon nap our early morning caught up with us! Sunday dawned a stunning day- and as we were right on the Avon cycle path – a disused railway path running from Bath to Bristol- in fact it was the first converted railway cycle path to be made, we decided to abandon plans to go back into Bristol and instead turn left and head the 7 miles to Bath. The cycle was absolutely gorgeous- we’d highly recommend it. It runs parallel to the Avon Valley railway for a small part (we were lucky to see a steam train depart Bitton station) then the path drops down alongside the river Avon into Bath. Gorgeous. was time to bid farewell to Bristol and Bath. We'd enjoyed our time here and loved all the Brunel sites in Bristol- I felt satisfied with the Balloon Fiesta- however to anyone thinking of coming for that, book camping early so you can have the while weekend here- we hadn't realised the chances of actually seeing the balloons go up were so slim because of weather conditions (I know, that's us being stupid!) You need the whole weekend as then it doesn't matter if it gets cancelled the first two days.. also book camping near to the fiesta site. Either Cotham Park RFC or Parsonage Farm (although you can't pre book that) All the motorhome clubs have rallies too but you need to ore book well in advance as it's very popular. Despite it being a free event you need to be staying local to avoid car parking charges as a) they are expensive and b) they'd sold out for Saturday and therefore people coming to Saturdays mass assent couldn't park unless they'd prebooked and it was a bit chaotic! ould be go to the Balloon Fiesta again? Probably not- unless they announced more entertainment- particularly entertainment for when balloons can't go up! Without the balloons going up it was dull as dishwater (on Thursday) – perhaps Saturday is different. There was also a lack of balloon stalls- the stalls were literally just catering or their sponsors. 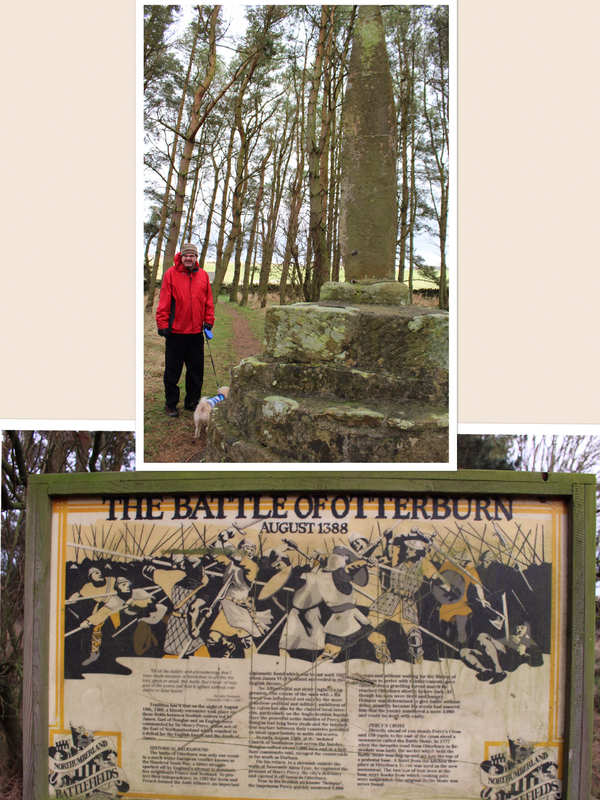 We retraced our steps back towards Otterburn for a quick stop at the site of the Battle of Otterburn, where there was a picnic area and info board, along with a large stone from the battle. The wind was absolutely savage so we didn’t stop for too long! We made our way back down the A68 and then made our way towards Kielder, a beautiful journey despite not being via the private forest drive (toll) as that is closed for winter. 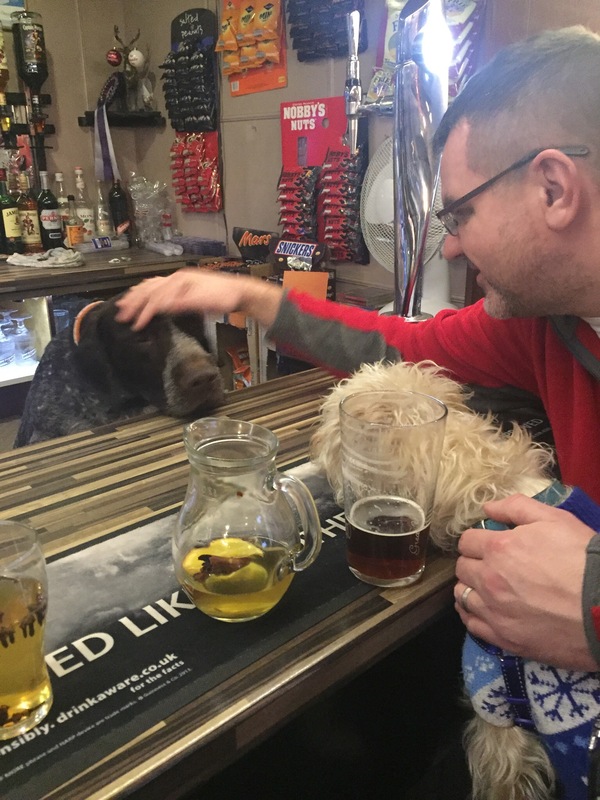 Our destination was Brit Stop number , a village pub right in the heart of Kielder Forest and Water park. We were intending on eating at the pub but with it being New Years Eve food service wasn’t offered all day, the menu looked good though! 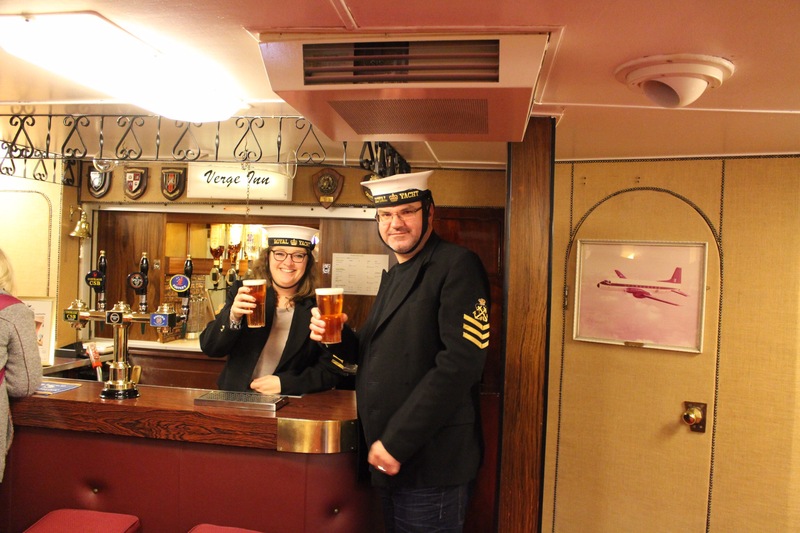 We opted for several drinks instead whilst getting to know the friendly barman (see below!) and then a cosy night in the van accompanied by a fillet steak and bottle of Pape! Yum. New Years Day dawned bright yet chilly. A perfect day for a bike ride, so we dismantled the wheels and set off for a few miles on the Lakeside Way path, a wide, hard surface track that is 27 miles long around the circuit of the reservoir. 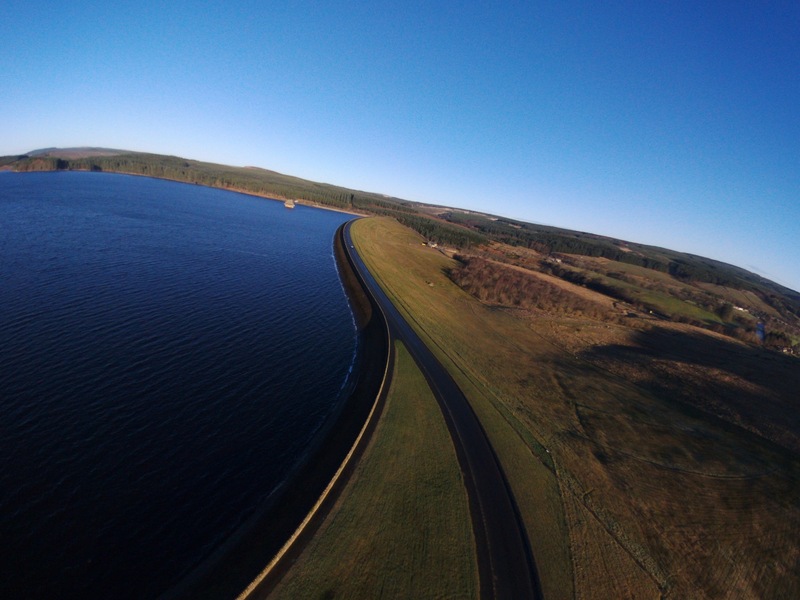 We didn’t realise that Kielder Water is in fact the largest reservoir in Western Europe! 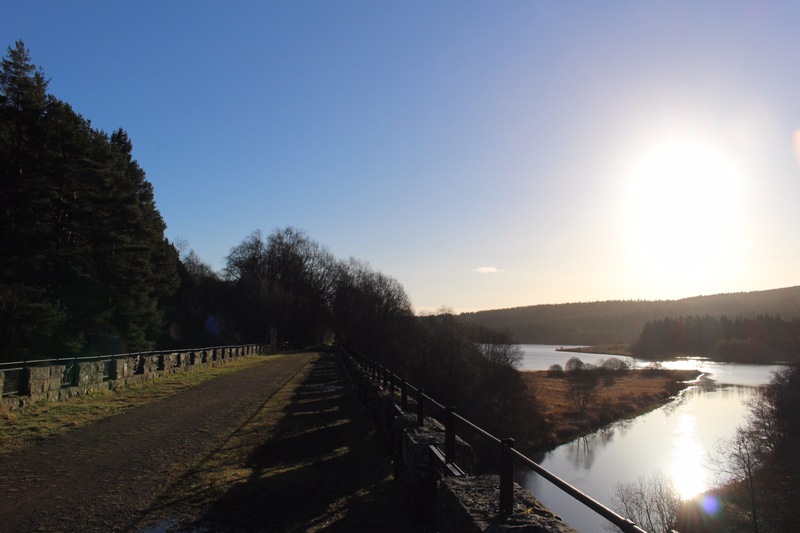 We didn’t fancy over-exerting ourselves, we’d had a lazy morning already, so just went on a short circular which took us under the impressive Kielder Viaduct, then over it, and alongside the lake for a little way before turning round and returning via Kielder Castle. In actual fact it was only about 4 miles! An old railway line over the Viaduct has been transformed into a decent cycle path which goes right around the water. I had a good play with my drone camera around the viaduct taking some amazing shots, and we also did some Geocaching too. It was a lovely day and the light was simply breathtaking, until the heavens opened as the sun set for the first time in 2017. Being New Years Day, food service in our Brit Stop was again disrupted, but they were happy for us to stay put for the evening and we returned the favour by enjoying a few pints of the local ale, which was very nice! Who says camping and caravanning means Beans on toast and Frey Bento pies..! 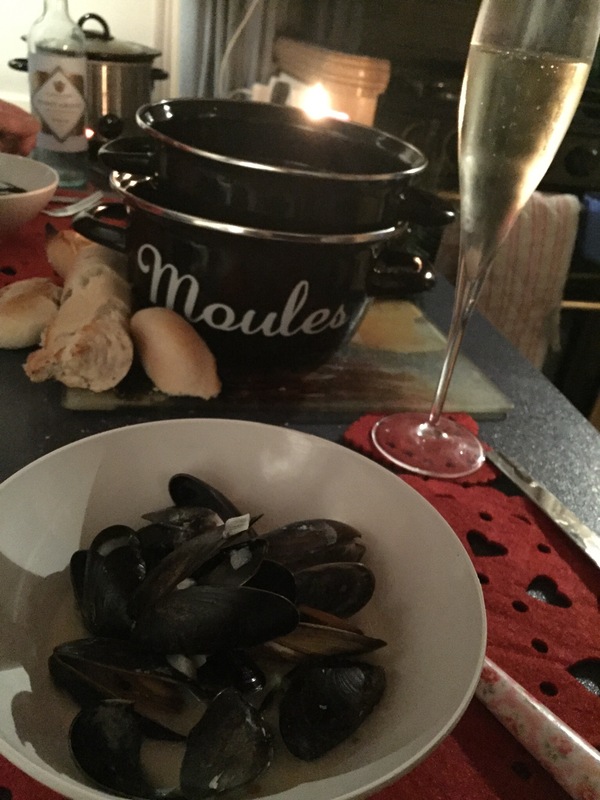 We had a New Year’s feast of Moules Marinade followed by chicken casserole for dinner in the van, and just as we finished eating we noticed a break in the pitter patter on our roof; the rain/sleet had stopped and a quick check through the sky light and bingo, the stars were out. Our main reason for visiting this area was the draw of the night time skies. Northumbria is a Dark Skies area, and Kielder actually has an observatory with telescope. Sadly the events at the observatory were all sold out for our trip however I’d been itching to get my new telescope out for play. Here was my chance. My highlight was viewing Vega- the star in which the film Contact receives extra terrestrial signals from.. cue some singing of that wonderful John Williams theme! We wandered up 100 yards or so to Kielder Castle and set up. The sky was phenomenal. We saw the Milky Way with our naked eye, and thousands of stars. Absultely breathtaking. Until a snowflake landed on my face. Then another. “Keith, did you just feel that” by the time he answered “Yes” we found ourselves in the middle of a snow storm! Northumbria, your weather is mental. We had another quiet yet cold night’s sleep, the temperature dipped to -3c, but we were toasty inside. We both woke early, a little apprehensive that the snow shower we found ourselves in the middle of, may have settled, causing us problems getting out of Kielder. We needn’t have worried, although there was an awful lot of ice on the ground, the road out of the forest park was clear. The weather again was gorgeous, a perfect winters day. 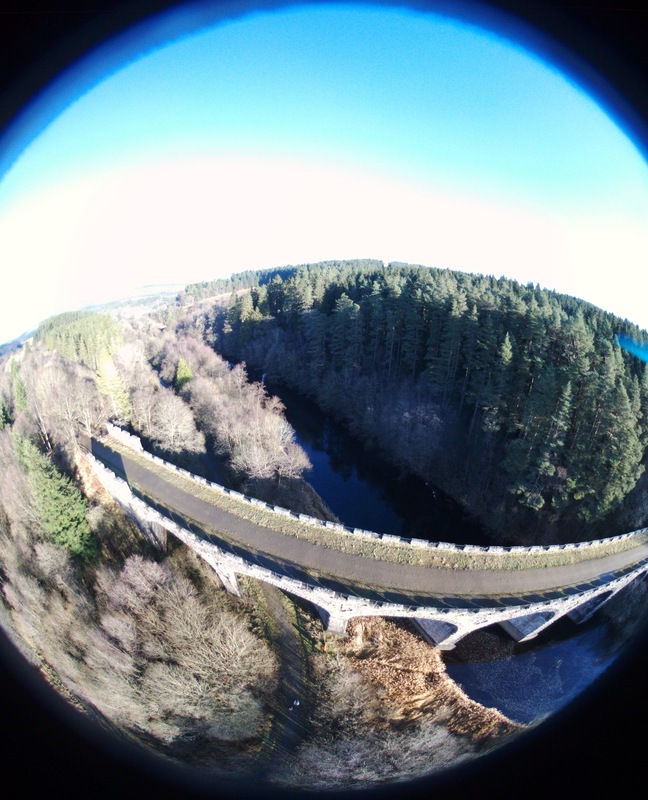 About 12 miles away from Kielder, we passed a large car park and viewing area for Kielder Dam. We pulled in for a leg stretch, and slip slided our way across the footpath across the dam. I also managed to get some more good drone shots despite poor Jazz’s protests, he’s not a fan of the flying camera! The light was beautiful. After a cuppa and the last of my gingerbread house (Annie, it really is yummy!!) we hit the road once more- our destination was Hadrian’s Wall. 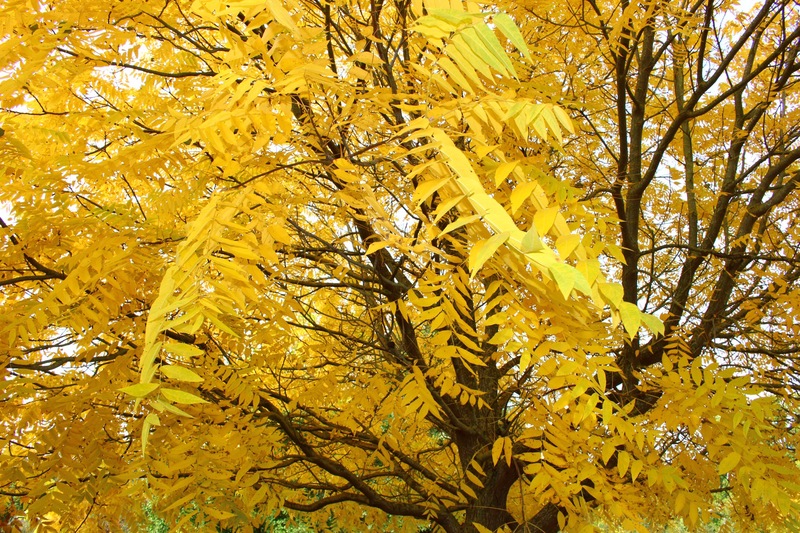 The nights are drawing in and the leaves are turning golden brown. There is the faint smell of smoke lingering in the air and it feels acceptable to draw the curtains, get the Jim jams on and watch strictly back to back. 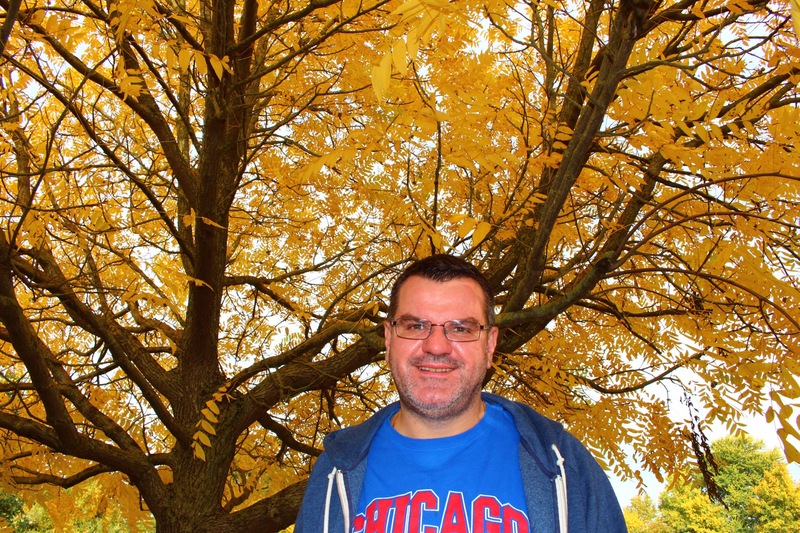 Autumn is here and al out rolled into winter! 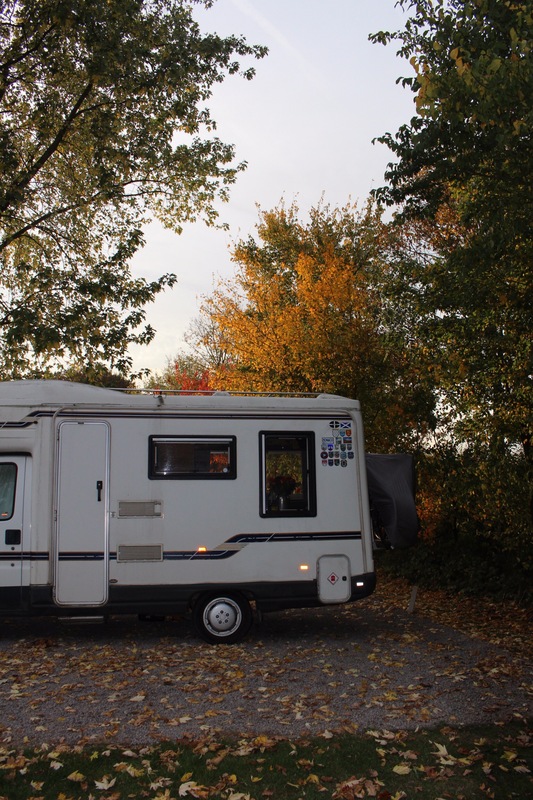 I feel like I’ve blinked and lost 8 weeks- since returning from our epic Europe adventure, poor Bluebell the motorhome has been having a big rest in storage, whilst we have seemed to be non stop! 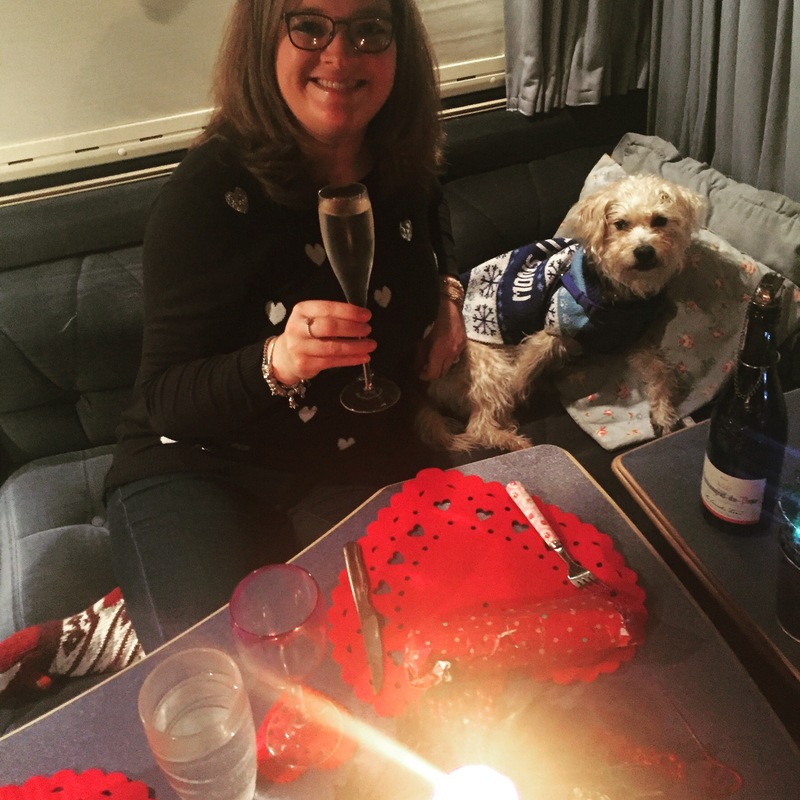 I couldn’t believe it, 8 weeks since our last adventure in a motorhome, it was most certainly time to go and get Bluebell and hit the road for a few days to catch the last few days of this gorgeous autumn we are having. Half term began for us at 7pm on Thursday, when we headed north in the car to Newark, where we dropped Jazz off for a weekend with my mum, then caught an early train up to Edinburgh- Keith had treated me to a weekend of non driving, and even so,asked out for first class- not that we will bother with that again, virgin east coast were diabolical and provided a disappointing start to my birthday weekend. We arrived in Edinburgh and had 3 great, booze fuelled nights staying with Simon, Keith’s cousin, in Leith. I set myself a target of trying every gin available in Scotland, and think I probably smashed it! 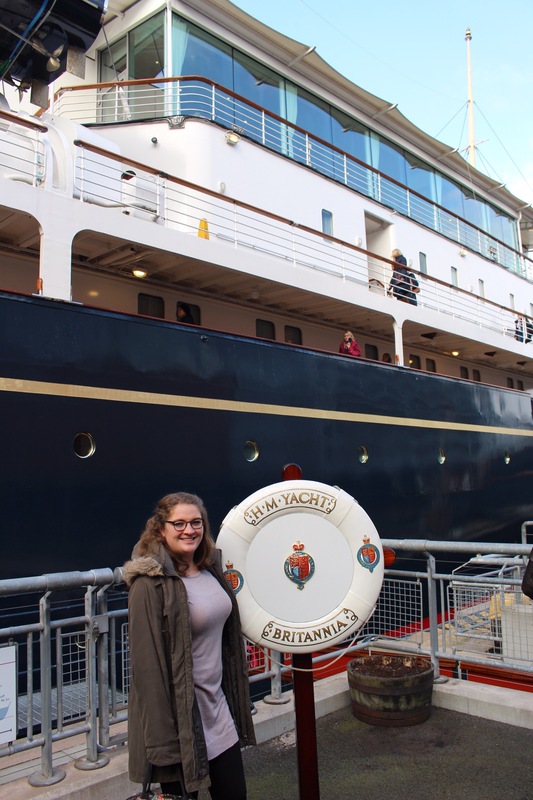 A highlight was our visit to the Royal Britannia Yacht. Well worth a visit if you haven’t been, we loved it. Monday, and my birthday, came and it was back on the train south to Newark to pick up Jazz and enjoy a birthday meal at Damon’s, famous for its ribs, in Lincoln with Mum and Alec. After a quick lunch with Dad on Tuesday it was back to Norfolk for a meal with friends Annie and Ash, before picking up Bluebell first thing Wednesday. We sure know how to cram things in! 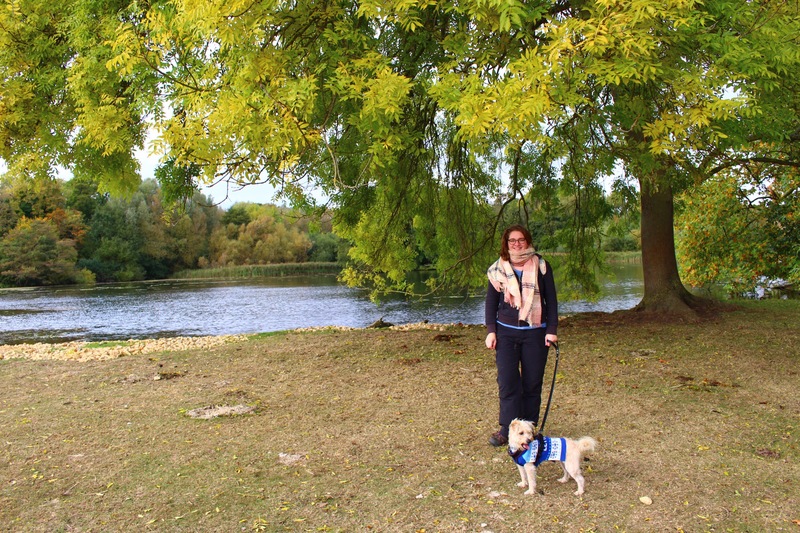 Our destination was only an hour down the road, to Grafham Water, a reservoir near to Cambridge. 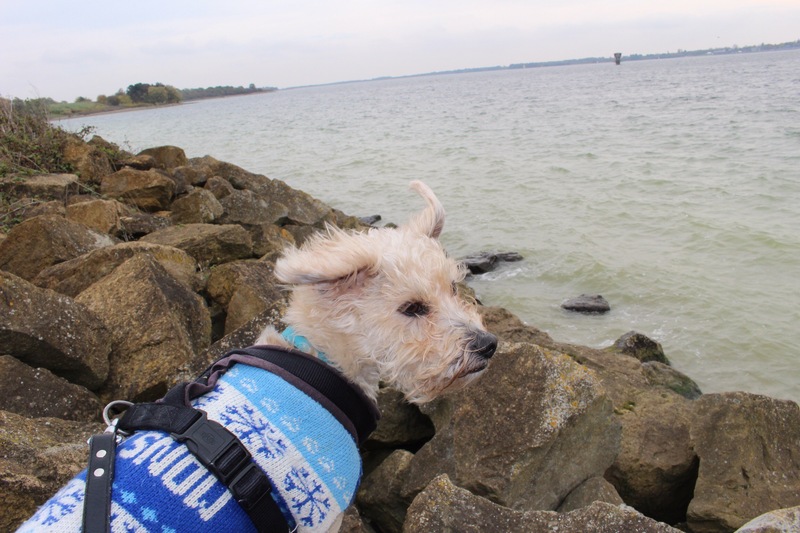 We had booked onto the Caravan Club club site at Grafham- unusual for us, but given its close proximity to the water and not much other option we went for it, and actually we really enjoyed our stay. 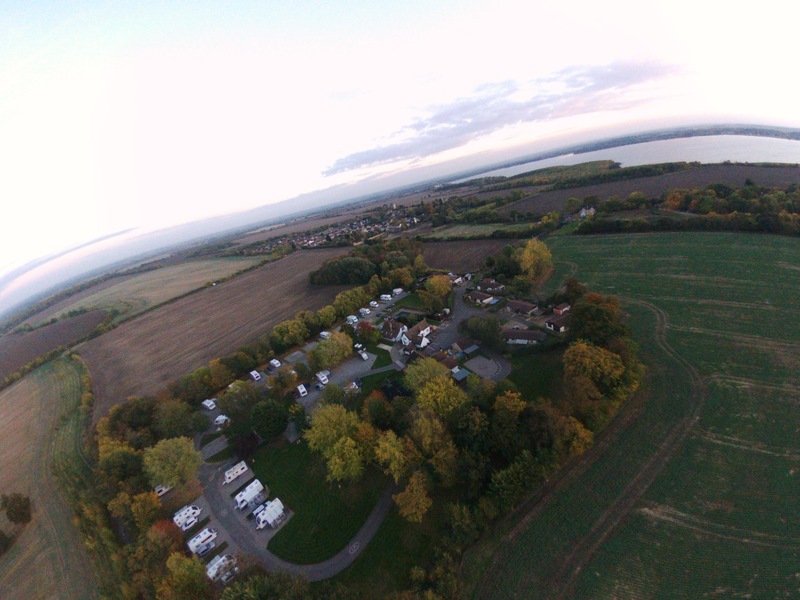 At £21.50 a night we thought it was good value for hard standing pitches serviced pitches. The site wasn’t as large as others we’d stayed on and the wardens not too overbearing. Phew. We also were hopeful that we would see Ollie the Owl whilst there, but sadly that wasn’t to be. After a quick lunch and nap, we wandered the half a mile into the village over fields, visiting the community shop and also stopping at a house on Church Road who sold fresh trout, line caught from Grafham water. We got a massive fillet for £3! 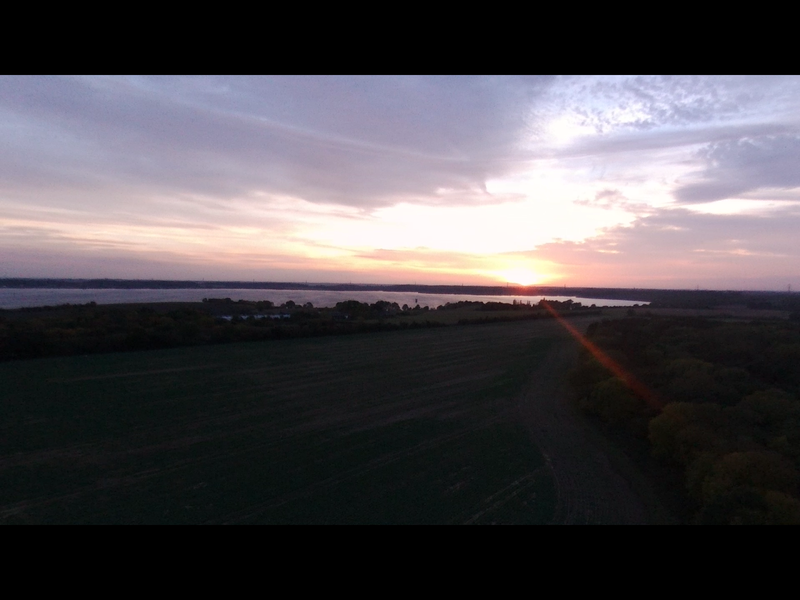 We did several circuits of the site around dusk looking for Ollie, and even had a play on my drone, which was interesting as it highlighted how close we were to the water! Next morning after a great sleep, I chucked some meat and veg into the slow cooker and Keith got the bikes ready. 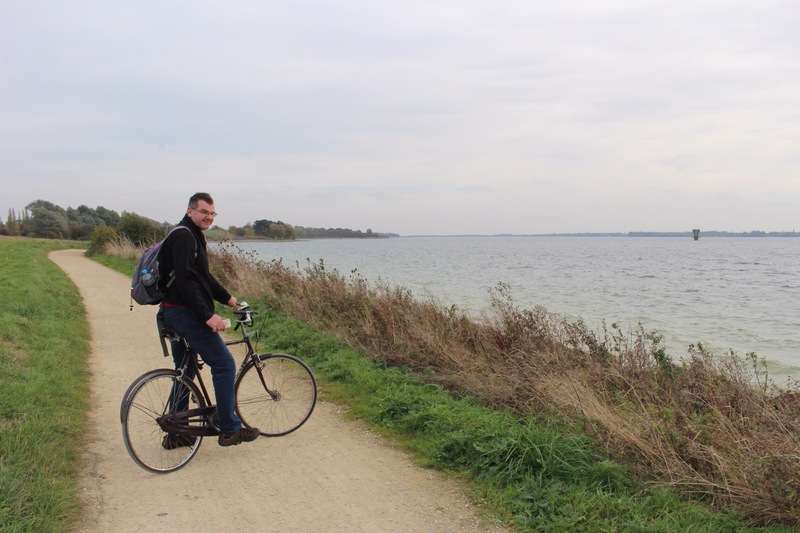 We were off on our bike ride around Grafham water by 10:30, promising to ourselves we would take it easy with lots of picture stops and even some geocaching. The ride itself was great, a real mix of terrains, not too steep, but through woodland, waterside, across fields and even through a village, all off road. 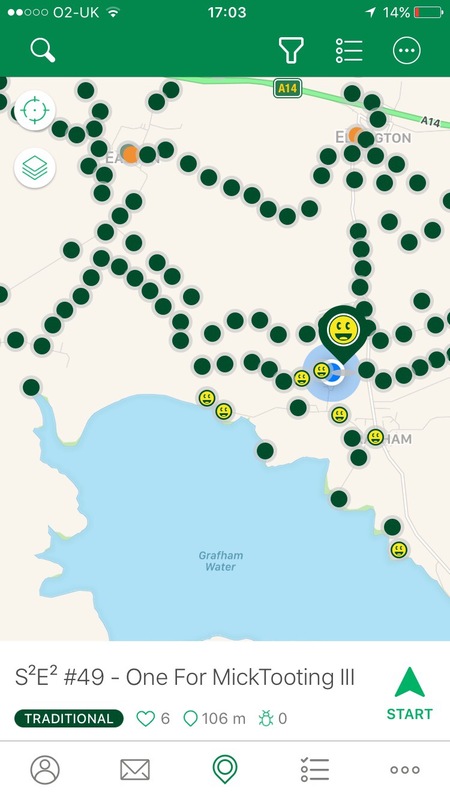 If you’re into Geocaching, it’s a cacher’s paradise, I’ve never seen so many caches in one area. We managed 8- and didn’t even scrape the surface – as you can see! We were very lucky with the autumnal light, and we had a lovely day. That night we tried to find Ollie the owl again,despite hearing him several times, didn’t catch a glimpse. Next time, and there definitely will be a next time. On route home the next day we decided to have a stop at Wimpole National Trust site, where we were treated to another phenomenal dismay of Autumn leaves. Bluebell the motorhome is all settled into our home for the next three nights, Topley Head CL site (Caravan Club, £10pn w/electric and hard standing), near Buxton, Derbyshire. We arrived here as the sun was setting but our whistle has been wet, and we are looking forward to daylight as the view looks promising! We had an uneventful journey up to the Peak District, arriving at Eyam just in time for our turkey and cranberry sauce sandwich and sausage roll lunch to be devoured! The weather was dry albeit notably chillier than down in Norfolk, and we set off with Jazz for a wander around this fascinating village- a village in which during the summer of 1665, a parcel of damp cloth from London changed the course of its future, sadly carrying plague infested fleas which spread and went on to kill 260 people in just one small, sleepy village. It’s such a pretty little place, right in the middle of a valley with hills surrounding and the typical white peak brickwork on all the houses. Most of the houses in the village have a plaque outside depicting who within those walls were killed. Some has as many as 9 family members who died in that one house – whole generations wiped out. Keith noticed that in many families the wife appeared to survive over the men and the children. There is a national trust property here, Eyam Hall, that was unfortunately closed today, but we are going to try and come back later in the week. A short drive from Eyam and we found our campsite for the the next 3 days. It’s right on the Monsal Trail, which we hope to cycle on tomorrow. The drive was through Millers Dale and reminded Keith of Lord of The Rings scenery! We are surprisingly the only ones on this site – amazing as it’s hard standing with electric and only £10 a night! It’s across the road from Beech Croft Farm campsite where we stayed a couple of years ago, a lovely site, but twice the price and looking very full from what we could see from the road! Dawned a bright winters day, perfect for a bike ride, so we were up and out by 10am after a lovely brew and some brekkie whilst enjoying this view from our window. 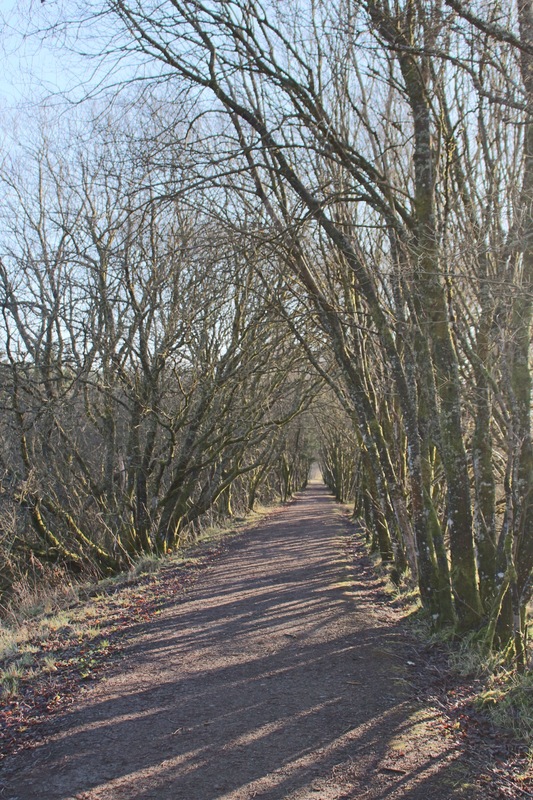 The Monsal trail is an old industrial railway trail that goes from Wye Bridge to Bakewell covering a distance of about 8.5 miles. It cuts through some magnificent countryside, passing serveral interesting sites along the way, including Lime Kilns and mills, through several tunnels and over the impressive Monsal Head Viaduct. It’s a lovely way to spend a day- and it seemed like the whole world was too, it was packed! Nice to see lots of people out and about in the fresh air, but sometimes a challenge navigating around those who thinks its ok to walk 5 a side, leave their bikes mid track etc! Never rang my bell so many times in a day! On arriving at Bakewell we assumed we would find bike parking, and spent a considerable amount of time trying and failing to find somewhere safe and unobstructive to leave them. Bakewell is such a pretty little town, home to the Bakewell pudding AND Bakewell tart, so it seemed rude not to buy two of each for a tasting later! Bakewell was even busier than the Monsal Trail, it was heaving! We rejoined the Monsal trail and headed back to Bluebell, the return journey was hard work on our unfit legs, but we really enjoyed ourselves nonetheless. I was pleased that I remembered to pack my hip flask – getting back up that hill to the campsite was haaaarrrrrddd! Storm Frank passed overnight and during today and although we didn’t get hit badly, in fact we both slept through it (! ), a day out during high winds and thrashing down rain was unappealing to us, so it was declared as a motorhome duvet day, where we literally stayed in bed til lunchtime watching Shogun, ate the leftovers in the fridge up, watched crappy tele, watched more Shogun, I read a book, then we went back to bed! We very rarely do this, at home or away, but enjoyed the chill enormously, and felt very rested, which is what holidays are for aren’t they, so will probably try and do more of this on subsequent trips!